For almost 20 years, Above & Beyond have helped shape and spread the feel-good sounds of trance around the world and this year is shaping up to be absolutely massive for the trance trio. They kicked off 2018 with the release of their sixth studio album, ‘Common Ground’, on their own Anjunabeats imprint, which is a growing empire unto itself. The album recently debuted at No. 3 on the Billboard Top 200 over in the States, joining the ranks of mega pop stars like Ed Sheeran, Migos, Kendrick Lamar, Bruno Mars and Taylor Swift, which is an impressive feat for an independent imprint like Anjunabeats. The group is currently touring North America in support of ‘Common Ground’ through mid-March, while Anjunabeats' sister label, Anjunadeep, is hosting its first-ever festival this August in London. And to top it all off, their brand-new concert documentary, Above & Beyond Acoustic – Giving Up The Day Job, which documents the trio’s 11-city live acoustic tour in 2016, is screening in selected theatres now. That’s what’s happening in Above & Beyond’s world in 2018 alone and it's literally the tip of the iceberg in their ongoing and illustrious career. Today, we’re paying homage to these icons with a look back at some of the group’s biggest milestones While this list can go on forever, here are 10 memorable moments that defined Above & Beyond. The scene: Electronic Daisy Carnival 2015 main stage, headline slot. Above & Beyond invite their personal Hollywood hero, Bryan Cranston, to join them onstage. He drops the trio’s Breaking Bad-inspired track ‘Walter White’, but not before he gives the sea of people a quick rendition of his most famous character: “Say my name!” bellows Bryan Cranston/Walter White/Heisenberg and thousands of awestruck Breaking Bad fans, including Jono and Paavo, reply in unison. The story as to how Bryan Cranston came to be at EDC, the world’s most infamous all-dance festival, in the first place is a good story in itself and involves emergency helicopter rides and a former NHL star, but we’ll save that for another time. Having toured the world as DJs for over a decade, the trio found themselves craving a new challenge. Inspired by candlelit MTV Unplugged sessions of the ‘90s, ‘Acoustic’ became two albums, a world tour and a soon-to-be released documentary. 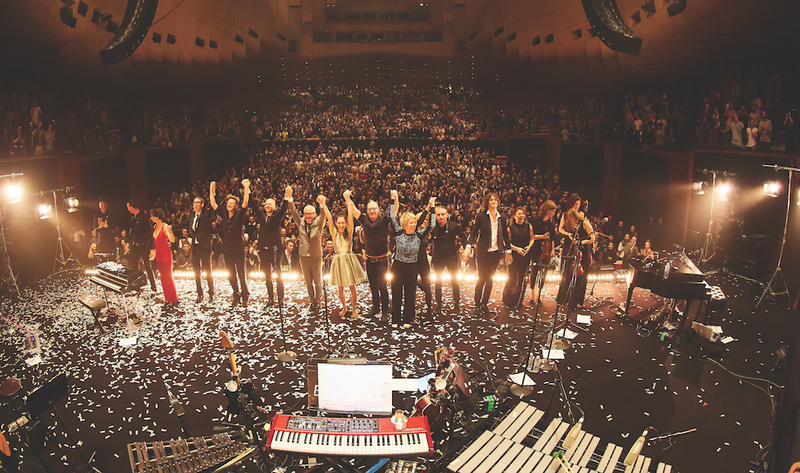 The Above & Beyond live band (which included longtime collaborators Zoë Johnston and Justine Suissa) performed for sold-out crowds at a dream list of venues: Sydney Opera House, Royal Albert Hall and The Hollywood Bowl, to name a few. On New Year’s Eve 2007, Barra Beach was the world’s biggest dancefloor. Revelers dressed in white stretching for miles along Rio’s famous shoreline are dancing to Above & Beyond’s Tri-State-era, vocal-trance repertoire. Sounds like a dream, although taking a leak probably wasn’t fun. To celebrate the 250th Group Therapy Radio episode, Above & Beyond hosted their own festival on a river gorge three hours outside of Seattle in Washington state. Attracting 25,000 fans over two days, Above & Beyond announced their new album, ‘Common Ground’, to a captive crowd, framed by the otherworldly beauty of the Columbia River behind them. The boys claim that two couples got engaged at their first Group Therapy Weekend but after seeing photos of The Gorge’s magnificent sunsets, we reckon the actual count could be much higher. In 2015, right in the middle of Above & Beyond’s huge We Are All We Need world tour, Jono received the tragic news that his sister, Charlotte, had passed away very suddenly. A mental health nurse specializing in post and peri-natal depression, Above & Beyond set up a charitable fund in her name and threw one almighty, all-ages bash at Wembley Arena to celebrate her life and work, raising over $250,000. The star of the night was undoubtedly Holly, Charlotte’s nine-year-old daughter, jumping onstage to push the button during ‘Sun & Moon’ and leaving not one dry eye in the house. Trance Around The World, first broadcast in 2004, was Above & Beyond’s much-loved weekly radio show. In June 2011 the group released their second artist album, calling it ‘Group Therapy’. A reference to the catharsis of attending an A&B show, the title came to represent the very essence of the A&B experience and fan movement and so, after 450 episodes of Trance Around The World, the trio decided to appropriate the same name for their radio show. On November 12, 2012, with Bangalore’s historic Jayamahal Palace Hotel as the backdrop, Group Therapy Radio was born. It’s 2001 and Tony is Director of Marketing at Warner Music UK. Jono and Paavo are up-and-coming producers, studying at The University Of Westminster in London, tinkering away on records for their new bedroom-based record label, Anjunabeats. Tony gets introduced to the pair via his brother and the three of them team up to remix Madonna’s ‘What It Feels Like For A Girl’. The result? Above & Beyond’s first global club hit, which Madonna loved so much she decided to use the remix for the single’s official music video. Can’t remember that one? Not surprising: in classic Madonna form, the video stirred some controversy and was quickly banned from MTV. Every 50th episode of Group Therapy Radio, Above & Beyond decamp the Anjunabeats office to a far-flung destination for an all-singing, sometimes-dancing live broadcast event. The annual show has become a kind of pilgrimage, with the 200th show in Amsterdam drawing fans from over 70 countries. But a highlight for the boys has to be their sold-out night at New York’s Madison Square Garden. The first British DJs to ever sell out the storied arena, the trip saw the boys enjoy their own little taste of Beatlemania, bringing Times Square to a standstill for a digital billboard-based premiere of their new single, ‘We’re All We Need’. Mounted police had to clear out the area as hundreds of Anjuna faithful scrambled for a selfie with the Terrific Three. You’re nested within a three-story structure, wired to thousands of red-hot stage lights with pyro equipment rigged to quite literally explode at the push of a button – it’s daunting at the best of times. Add one of Miami’s notorious tropical rainsqualls to the mix and the entire robotic beast splutters and dies about 15 minutes into Above & Beyond’s set. With waterlogged LED strips hiccupping sparks over their heads, the only safe and operational pair of CDJs to be found were backstage and pointing away from the crowd. The show must go on, and Above & Beyond finish their set with their backs to the 50,000 strong audience. Watch our new in-depth interview with Above & Beyond as part of DJ Mag Insight below.